Welcome back! I’ve been busy rebuilding the Region 2 AHS daylily site. http://www.region2daylily.org . Between working on all of my other AHS volunteer projects and my personal responsibilities, my Blog time has been greatly reduced. 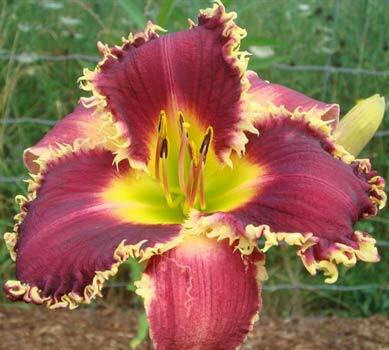 But tonight I would like to recommend another top 2003-2008 teeth daylily. Venus Fly Trap, hybridized by Jamie Gossard. As many of you know , Jamie is a close friend and associate so I’d venture to say I know and understand his program only second to Jamie himself. Venus Fly Trap (Order or Chaos x Shinto Etching) x ( Forestlake Ragamuffin x Heavenly Beginnings). Venus Fly Trap is registered as a dormant but in our garden it is a hardy evergreen. Venus Fly Trap has many positive qualities that make this daylily the one of the best Gossard teeth introductions to date. The strengths are found in its tall (34 inches) well branched scape and budcount. Surprising Jamie lists Venus Fly Trap with just a 20 budcount but in our garden it is closer to 30 budcount. The weakness that I’ve observed in V.F.T. is like many purples, the color fades and the substance weakens in the afternoon. 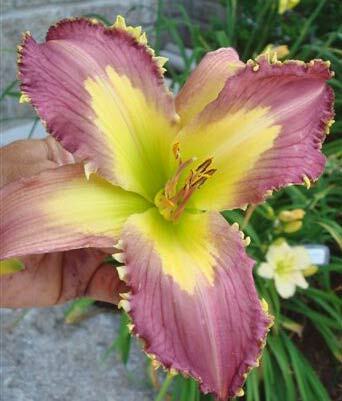 But as an easy opener, re-bloomer, and fertile both ways combined with the listed positive qualities makes this daylily a top bagel purple teeth introduction from 2003-2008. Dave Mussar sent me over an image of V.F.T. displaying white nice teeth way up north in Canada. I am still happy to use this daylily in our hybridizing program. © 2012, Mike. All rights reserved. Copyright extended to images. This entry was posted in Daylily Hybridizing, People Pictures, Seedlings and tagged daylily, daylily blog, daylily teeth, Jamie Gossard, michael georges, region 2 daylily ahs, venus flytrap. Bookmark the permalink. VENUS FLY TRAP is arguably the best dark burgundy purple teeth variety in commerce. Better here in Cincinnati than in Dave’s pic, with teeth that are closer to white and more pronounced. BRIAR PATCH has an even better bloom, but VFT has a superior scape and much more vigor. Everyone breeding teeth should be growing VENUS FLY TRAP. VENUS FLY TRAP does very well here in eastern Nebraska as well, with our variable weather. It is not an easy pod setter for me, but the pollen is very fertile. This past summer I did get three pods from it, one from of Karol Emmerich’s MY UTMOST FOR HIS HIGHEST, which is out of GNASHING OF TEETH, so hurry up 2013 bloom season.